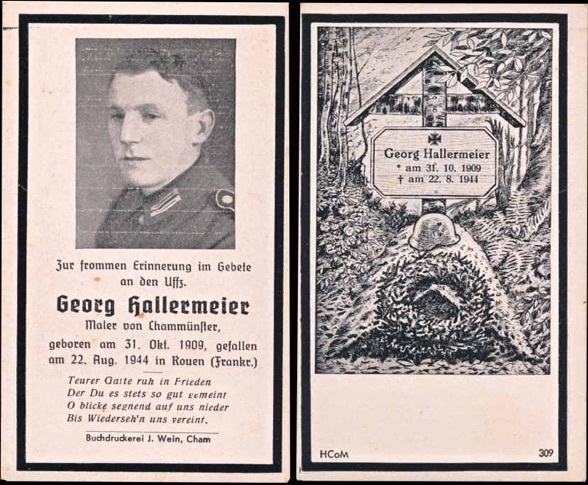 WW2 German Death Card (Sterbebild) for Army Unteroffizier Georg Hallermeier. Killed in Rouen, France, 22 August 1944. He was 34. Back of card has a rendering of his grave. The double page single sided card measures about 5.5 x 4 inches. Includes a German Graves Office slip listing him as killed at Rouen and buried in Champugny St Andre, France. 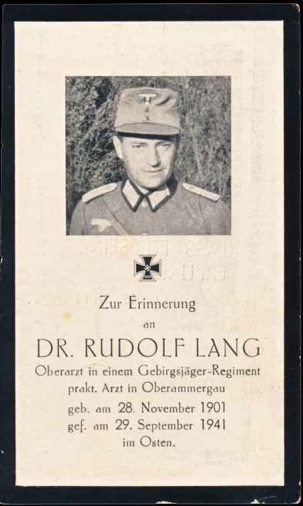 WW2 German Death Card (Sterbebild) for Army Oberarzt Dr. Rudolf Lang, Gebrigejaeger Regiment. Physician in Oberannergau. Killed in the East, 29 September 1941 He was 39. Nice uniform photo with Mountain Troops hat. The back of the card has a Bible verse. The single page, single sided card measures about 2.5 x 4.25 inches. Includes a slip from the German Graves Office stating he was killed and buried in Beloserka, Ukraine. 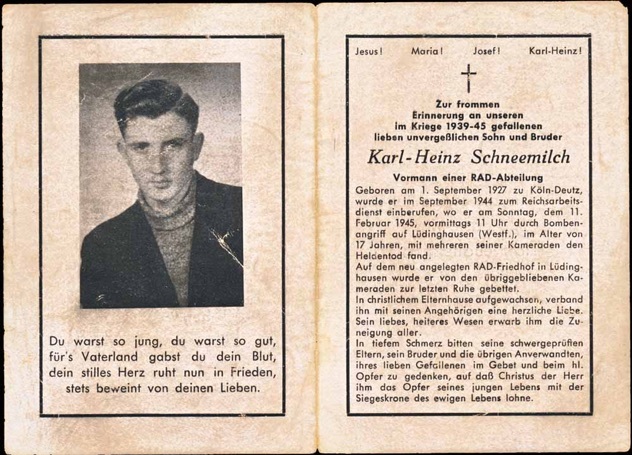 WW2 German Death Card (Sterbebild) for RAD Vormann Karl-Heinz Schneemilch. When he was 17 in September 1944, he went to the RAD. He was killed in the aerial bombing of Lüdinghausen, Sunday 11am, 11 February 1945. He was buried in the RAD cemetery there. The double page, single sided card measures about 6.5 x 4.5 inches. 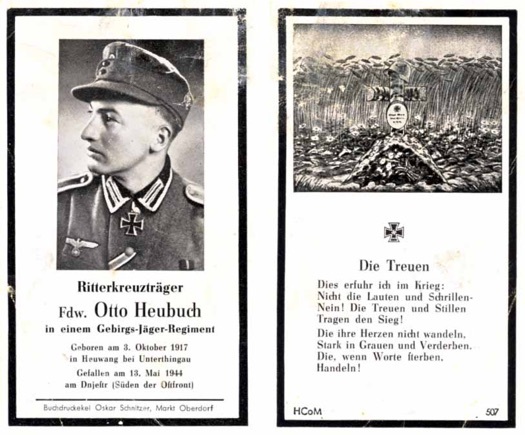 WW2 German Death Card (Sterbebild) for Army Feldwebel and Ritterkreuzträger Otto Heubuch, Gebirgs Jäger Regiment. He was awarded the Knight’s Cross of the Iron Cross 8 February 1944, as am Oberjäger and fire team leader with 16 Gebirgs Jäger Regiment 13. He was 26. In the uniform photo, he is wearing the Iron Cross 2nd Class ribbon, the Knight’s Cross and a single ribbon bar for the Russian Front Medal. The back of the card has a rendering of a grave. The single page, single sided card measures about 2.5 x 4.25 inches. Includes a slip from the German Graves Office stating he was killed in. Puhaceni and buried in Kischinew, Moldavia. In good condition with slight wear. 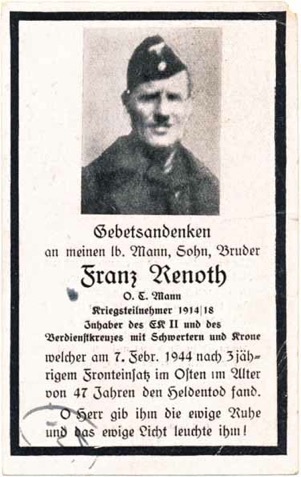 WW2 German Death Card (Sterbebild) for Organization Todt Mann Franz Renoth. Participated in the war, 1914-1918. Was awarded the Iron Cross 2nd Class and the Military Service Cross with Crown and swords. Served 3 years at the Front in the East, and was killed 7 February 1944. He was 47. He wears an O.T. overseas cap and tunic in the photo. The back of the card has a rendering of his grave. The single page, single sided card measures about 2.5 x 4.25 inches. In used condition with a nip to the very right upper tip. 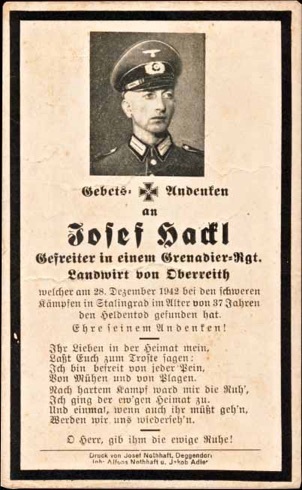 WW2 German Death Card (Sterbebild) for Army Gefreiter Josef Hackl, Grenadier Regiment Regiment. Killed in the difficult fighting at Stalingrad, 28 December 1942. He was 37. The back of the card has Jesus. The single page, single sided card measures about 2.5 x 4.5 inches. Includes a slip from the German Graves Office listing him as killed at Stalingrad and buried in Rossoschka, Russia. 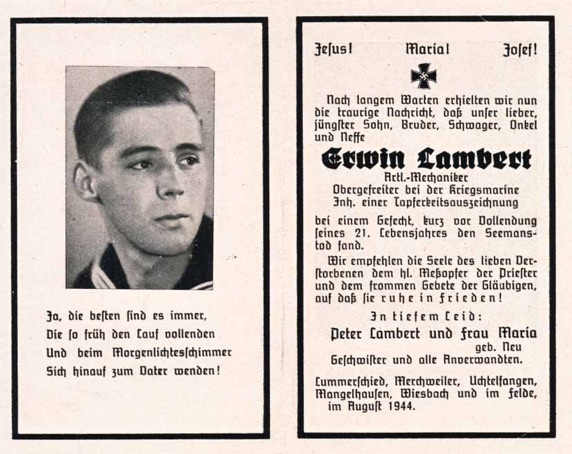 WW2 German Death Card (Sterbebild) for Kriegsmarine Obergefreiter, Artillery Mechanic Erwin Lambert. Was awarded the Bravery Medal. Died a seeman’s death in combat. He was 21. The back of the card has religious scenes. The double page, single sided card measures about 4.5 x 5.75 inches. Includes a slip from the German Graves Office listing him as killed 28 December 1943, and his name is on the monument at Laboe. Both the Destroyer 27 and Torpedo Boat 26 were sunk during the Battle of Biscay, 28 December 1943. In December 1943, a German destroyer flotilla reinforced with 6 large torpedo boats were charged with escorting 2 blockade runners safely into a French port. The German operation was code named Bernau, and the blockade runners were carrying cargo from Japan. The British cruisers HMS Enterprise and HMS Glasgow sank the T-26, T-25 and the destroyer, Z-27. There is a great detailed description of the Battle of the Bay of Biscay on Wikipedia.